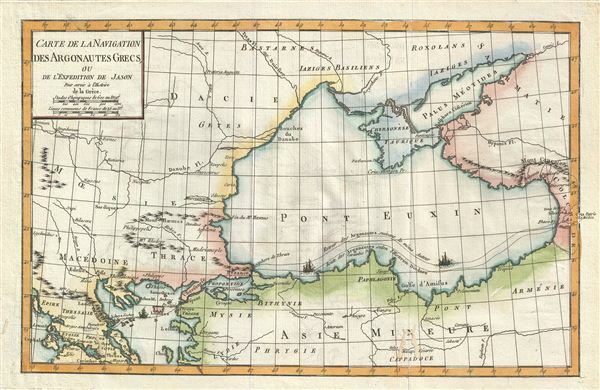 Carte de la Navigation des Argonautes Grecs, ou de l'Expedition de Jason pour servir a l'Histoire de la Grece. This is a fascinating example of the 1770 Jean-Baptiste-Claude Delisle de Sales' map of the Black Sea and surrounding regions illustrating the Argonautic Expedition. Depicting the mythical journey of Jason and the Argonauts, this map, centered on the Black Sea, covers from modern day Romania to Turkey. Numerous important towns and cities throughout. In Greek mythology, the Argonauts were heroes who during the Trojan War, accompanied Jason, the rightful king of Iolcos, in his quest for the Golden Fleece. They traveled from Iolcos (Lolchos) to Colchis (Colchide). The map identifies the route of the Argo (the name of their ship) according to the Greek historian Diodorus Siculus. The route for their return is also marked here, illustrated by ships sailing in the ocean. Jason is also believed to be the mythical founder of Ljubljana, Slovenia's capital city. Several rivers, mountains and other topographical details are noted. This map was issued as part of Delisle de Sales' Histoire des hommes. Partie de l'Histoire Ancienne. Becasue most of Sales' work was burnt under the censorship of heresy, this volume is exceedingly rare. Very good. Original platemark visible. Minor wear along original folds. Blank on verso. Minor damage and verso reinforcement at two places near lower border.